I have recently got into what I would call ‘proper’ dressmaking, actually following a pattern and making considered decisions, rather than just making things up and keeping my fingers crossed. I think my problem was I was getting a bit over whelmed and found the idea of adjusting a pattern very daunting. However with the wealth of information on the internet from blog and helpful hints on Pinterest it’s far less intimidating. The pattern I choose was the Lilou Dress from Tilly and Buttons – Love at first Stitch book, I thought the style should suit me and having previously sewn a Coco top, the Megan dress and the Margot pyjamas, steadily building up my confidence I thought I’d be alright having a go at the most complex pattern (though not actually too difficult) from the book. Not knowing how well the bodice would fit I very sensibly made a toile (something I’ve never really bothered with before – rookie error I know). I measured myself, in case I’d changed since my last project, my measurements came out as bust 34’’, waist 29.5’’ and Hips 39.5’’, not quite fitting a single size (as usual). So I initially made one adjustment on the bodice and made the side seams go from size 3 under the arms out to a size 4 on the waist. The skirt pattern I cut out at a size 4 (closest size for my hip measurement). 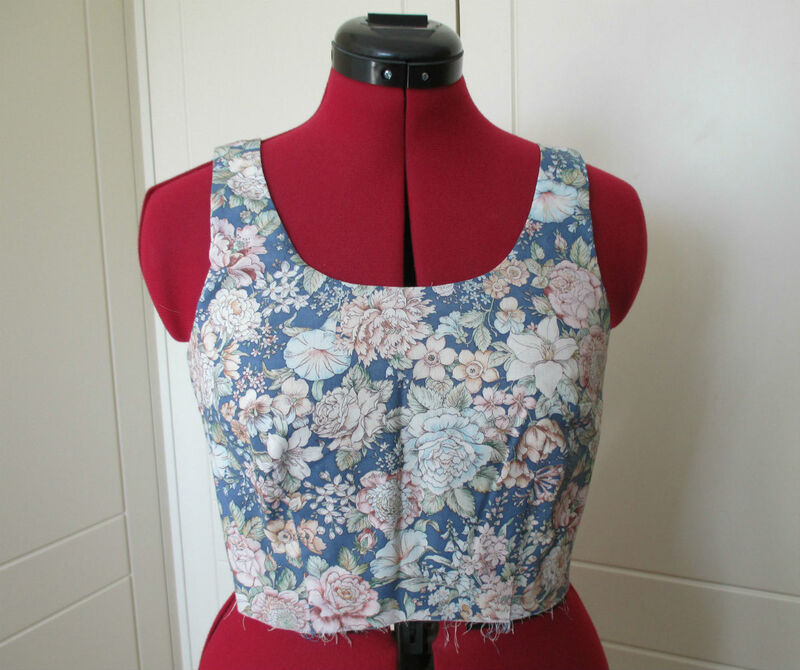 I completed the bodice, including adding a lining (I wanted the practice), in some floral fabric I inherited from my Gran in a similar weight to my dress fabric. The first bodice was a terrible fit – well it just didn’t fit. I was determined not to get put off even though I was a little frustrated as I’d checked the measurements and everything seemed to go well. It was a little loose on the waist, the back was baggy, there was way too much space across my bust, the straps stuck out and it was too long. I started thinking about how to address each issue. 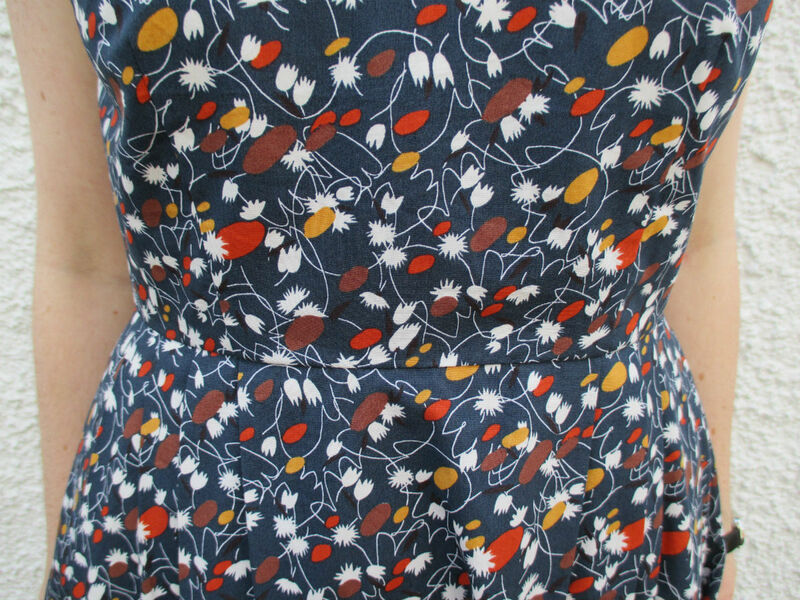 I’ve read about FBA (full bust adjustment) and SBA (small bust adjustment) when I first attempted the hawthorn dress (which I got too overwhelmed by and couldn’t face tackling at the time – it is currently hibernating). So I took a deep breath and starting googling SBA. I came across this great blog post Hungry Zombie Couture – My Cup Does Not Runneth Over I was relieved to find these wonderfully wise words, as I believe the lack of information and “just reverse a FBA” is what put me off tackling previous patterns. So taking on the advice of Shannon before getting too involved in my adjustment, I tried decreasing the depth of my bust dart; I traced off another bodice pattern this time all at size 3, making the waist smaller, then decreased the bust darts by 2cm but kept them the same length, I also shortened it by 2cm and tapered the straps towards the shoulders by 5mm. I also trimmed a little fabric off the bottom of the arm holes as they’d been a little sung. I tried it on at this point without the lining and found the fit on the waist and bust much better, there was still extra space in the back so I just added an extra 5cm in the length of the back darts and that did the job, I then made the lining and attached it so that I could make sure it all worked together and it did – phew! I hadn’t done a toile of the skirt, I knew I’d easily be able to adjust it if necessary, however I did have to retrace the pattern as I’d changed the waist size to a 3, so I needed the top of the skirt to also be a size 3. I also lengthened the skirt by about 5cm so it hit my knee and I’d feel comfortable wearing it without tights in the summer. I decided to treat myself to an invisible Zipper foot – it’s amazing! It made adding the zip so easy, I don’t know why I haven’t bought one sooner (well actually I do it was £19.95 – it made a nice Birthday present to myself). Once I fitted the zip (before I finished attaching the lining) I tried the dress on and discovered that it was overall a bit big *huge Sigh*! I unpicked the zip and trimmed 1cm off each side of the back edge (including the edge of the lining) and reattached the zip – it did the job and fitted *relaxed sigh*! I hastily finished everything off, including leaving a raw seam in the back and a crude hem as it got to 10pm the evening before I needed to wear it to a friend’s wedding. No one noticed and I can now sort that out while not having a deadline looming over me. Eek – looking at this makes me realise just how pasty I am, I’m almost blending into the white pebble dash here, I’d also like to point out that these were not the shoes I wore to the wedding, I wore posh navy shoes. The brown summer flats were all I had with me when I got my Mum to take the photo. I was impressed with how neatly the darts and pleats met at the waist and having never lined a garment before I quite enjoyed discovering how easily it all went together. Overall it has definitely been a great learning curve, as frustrated as I got at points I kept my cool and persevered (including the point when I got the lining stuck in the zip at the final trying on stage – eek). Even though I now have a pattern I could re-use I’m sure about the idea of making this dress again, there’s still a few, minor, fit issues. Although having said that I have decided to make the toile (which isn’t too bad really) into a finished dress with a gathered skirt, I might as well, especially given how much time I’d have spent working on it. 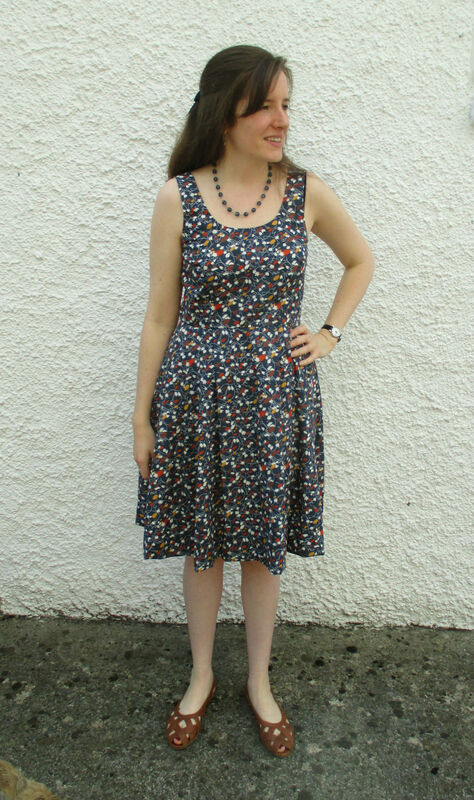 I realise this is yet another lengthy blog post, however when searching for people who’d written about their Lilou dresses I wanted to know more, what exactly they adjusted and why, I decided it wouldn’t be such a bad idea to give a blow by blow account of my journey with this pattern and show that it’s doable for even a relatively novice dressmaker (& if I do ever make it again I’ll have a record of what I did). I’m eager to do more sewing now, I need to practice my button holes, maybe the Mimi blouse would be a good warm up and even give me the confidence to attempt the Hawthorn dress again. 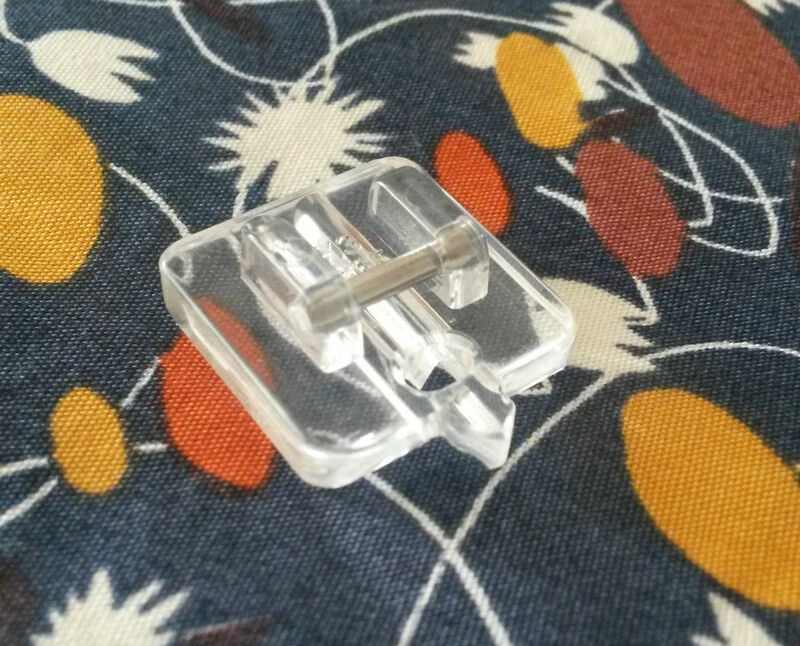 Thanks for reading, I’d welcome any hints & tips to help with my dressmaking adventures! Does the boOk include how to make a lining for the bodice and skirt of the dress? Hi Dede, the book goes through lining the bodice, the skirt doesn’t nesseserily need it, but I’m sure it’d be possible to line that too, if you wanted. I hope that helps.